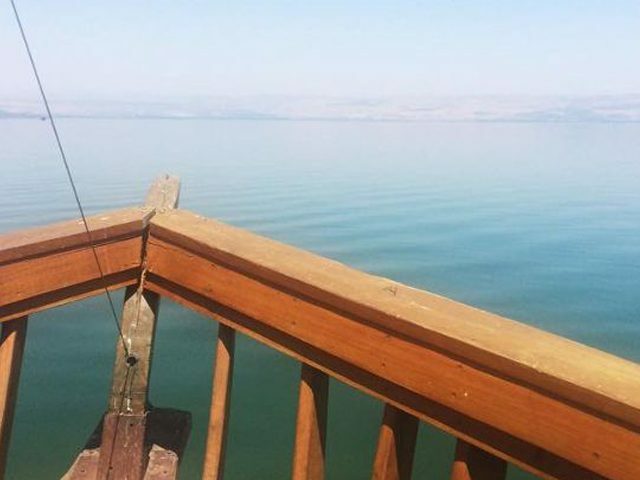 I wish my body to be cremated and for my ashes to be scattered on Lake Kinneret in Israel. These were the words my mother wrote in her will; so, last summer, I travelled to northeast Israel to honour her request. 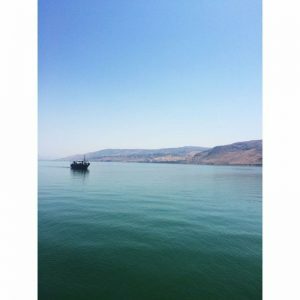 My aunts, Esther and Hannah, had organised the hire of a boat to carry us across the lake, also known as the Sea of Galilee. The company, Holyland Sailing, insisted that all their crew wore matching black t-shirts with the firm’s name on them. I felt uncomfortable with the stocky men and aunts, none of whom I knew. With their short dark hair and thick, waistless figures, I struggled to believe that these women were my mother’s elder sisters although I knew that they were. ‘Diamonds,’ Aunt Hannah helped her out. Beneath the vessel, the water pleated itself like silk. Eucalyptus trees blinked in the morning light. Tucked carefully under my arm was the box labelled with my mother’s name: Rose Williams: Cremated Remains. Number 95305. Funeral Director: Hudson and Son, Bath. ‘Of course,’ said Aunt Esther, seeing me read the label. ‘Your mother’s real name was Shoshana Ullmann. We never knew her as Rose.’ We let the words and history hang in the air between us. My aunts, both dressed plainly in linen trousers and unadorned blouses, had skin much darker than my mother’s, as if forty years of disappointing English summers had drained her of any colour. She was also slimmer and lankier than her sisters and the youngest of the three, the most reserved. In the past two weeks in Israel, my head had been spinning with questions: why did my mother leave Israel when she was twenty one? Why did she never return, even to visit? Why did she distance herself from her parents? Why did she anglicise her name? Why did she deny her Judaism? Why did she make a monthly payment to her sisters when they are clearly not short of money? And most curiously of all, why did she make a request that her ashes were scattered on a lake in a country she had rejected? My aunts had taken great pains to introduce me to Israel and to the many cousins whose names I did not know and found it hard to remember: Noam, Shira, Ohav, Irit, Uri, Yakov. There had been so many warm occasions where I had struggled to work out how we were related. My solution had been to be as polite as I could be, conscious that my white skin and cautious manner must have seemed as alien to them as their dark skin and effusiveness were to me. Now that both sisters lived together again in the family home, Esther (widowed) and Hannah (divorced) filled their days with visits from their family. They ate at a large table, served by their Arab maid Mimi, who limped slightly as she carried plates of food, her eyes always downcast. With pride, they showed me their garden. Wrapped around the stone house in Herzlia like a colourful sash, it burst with fruit: mangoes, fat and juicy; pomegranates gleamed like red baubles; passion fruit and guavas concealed their moisture beneath rough skins. I loved strolling there in the early morning before the burning sun appeared. Banana trees with their wide leaves; palms with golden dates stored high like jewels; citrus trees bearing hard, green globes, waiting to ripen; olive trees fluttering their silver foliage whenever there was a slight breeze; and in the centre of the garden, a single rose bush, its flowers pale and pink as if blushing at the incongruity of being in this exotic terrain. ‘We grow zis for your muzzer,’ Esther told me. But I noticed that Hannah walked silently on. The time I spent with them was filled with love and warmth but I also sensed that they were holding something back, just like my mother always did. Their home was simple but pleasant: books straight on the shelves; pale watercolours of Israel; framed black and white photos including one with my teenaged mother and her sisters, Mum in a short skirt and beaming broadly, so unlike her later self. 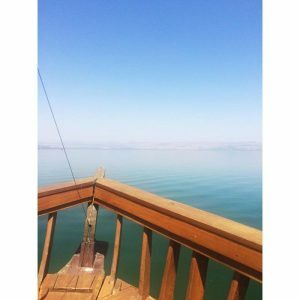 During my stay, my aunts opened my eyes to Israel. I liked Jaffa, its yellow stone and bobbing boats in the crowded harbour. I enjoyed Tel Aviv, its busyness and sophistication. Ash Dod, a new city, gleamed with pride in the white light, each roundabout adorned with a sculpture, of birds on sticks or pomegranates spilling from their skins. Haifa, spread below us like a feast, was lit up prettily at night. Jerusalem, where Jews wept at the Wailing Wall, Muslims answered the call for prayer, and Christians in organised groups made pilgrimages. I could feel the depth of belief in the hot, golden stones where I laid my hand, and did not want to leave. Osofia with its Druze market where I bought my father a silver coffee pot with four tiny cups on a matching tray; the women in their black robes and white headdresses reminding me strangely of Vermeer paintings. But among it all I felt tension. Not only the soldiers carrying guns and security at every mall and train station. Not only the stories of the Orthodox spitting at secular girls because of their immodest dress. Not only the way that all Israelis are by nature political in a way that the British are not. My aunts scanned the daily papers for news. While I was there the headlines told of an Orthodox Jewish man who had stabbed a young woman in a gay parade in Jerusalem. A Palestinian family with a baby daughter were burned alive in their own home. I came to realise that Jews and Arabs lived against a daily backdrop of fear. But the tension was closer to home, too. Hannah and Esther bickered constantly, slipping into Hebrew to do so, perhaps finding its guttural sounds and harsh consonants more appropriate for quarrelling. Although they disagreed on the food, the shopping, the instructions to Mimi, I also suspected that they were talking about me, a wave in my direction or a glance towards me and then looking quickly away. Then, returning to English when they were calmer, the soft sounds more conducive to civility. ‘We must give back the West Bank to the Arabs,’ said Esther in one of their rows. ‘But not the Golan Heights,’ added Hannah, and another argument ensued in Hebrew. ‘Yes I do.’ I recalled that once my mother’s two sisters had come into our gentle lives and I thought then, although only about fourteen at the time, that it was as if something unfamiliar entered our sphere briefly like a rare butterfly before fluttering away. The next morning, Esther gave me a copy of Carmi’s At the Stone of Losses and his sparse, meaningful words reduced me to tears. She also lent me poems by the poet Rachel, ‘In My Garden’ and ‘Will you hear my Voice?’ Days later, she took me to see the grave of the poet in the Kinneret cemetery, and the single, simple name on her headstone. I saw that others had placed stones on graves and so I did the same on hers. I had been emotional on this trip, which would surprise Hugh: his ongoing complaint about me was that I was too distant, that I didn’t connect. My mother’s daughter, maybe. In spite of really liking him, I had been unable to commit, scared perhaps by the two young daughters who lived with his ex-wife, and how they would react when they met me. Scared maybe of the age gap, my twenty-five to his thirty-eight. Worried about what kind of mother I would be. Afraid of opening myself up to show how I really felt. I had been really homesick, missing Hugh, missing my father with his cool spectacled face and his soft kindness. Missing our garden and cottage in Bathford, its genteel Englishness, the honeysuckle climbing around my bedroom window and sweetening the morning air. Missing my mother who had passed away the previous September, not fighting the cancer but submitting calmly to it, almost as if she felt that she deserved it. Ours had been a quiet, understated family, no-one really expressing their emotions: my doctor father, genial and good, his hair now whitening, with rumours of an early unsuccessful marriage before he had met my mother. And she, dutiful, always supportive of me and attending every concert and play at my girls’ independent school tucked away discreetly in the hills. And yet when it came to the huge bear hugs that I witnessed other families giving, it didn’t happen with us. My father would pat me on the shoulder if I did well, my mother put her arms around me but almost without touching. If I asked about her past in Israel, the details were sketchy. And then she would turn away and busy herself in a task, which I understood to be a signal that she didn’t want to talk further. When I was asked my religion at school, my mother would tell me to write ‘none’ and I was brought up with no Judaism at all. We did not light candles on Shabbat; we did not go to synagogue on the High Holy Days or any others; we did not have a Chanukiah; we did not dip apples into honey on Rosh Hoshanah. I learned about those festivals in RS lessons, but they remained theory, not practice: something other people did. At home, we observed Christmas modestly as if Mother were uncomfortable about it. We had a small tree with white lights and modest presents, though not lack of money but because my mother was ashamed at celebrating a Christian festival. I learned more about her after she died. She left me money to continue my PhD; she left donations to the Centre for Peace Studies in Jaffa founded by Peres, and to the Divan, the Arab-Israeli orchestra founded by Said and Barenboim; she left instructions for a humanist funeral including music by Louis Armstrong and Bach; and most enigmatic of all was the request in her will. It took me months before I was able to face sorting out her wardrobe. I put all her copies of Country Life in a pile for recycling. I folded her clothes – the sensible skirts, the flat shoes, the beige cardigans, the long cotton nightie and white underwear – into bags for Oxfam. All the while, I fought back tears and felt that I was handling a costume, a role, like a young actor in a film who plays an older character, as if she had assumed a false identity. I felt overwhelmed with regret that I had not really known her, that only after she had gone had she come to me. And there my dust will settle. I am the lake. I am the fish. I am the leaves that float. I am a part of whatever grows. There is no other eternity that I desire. Even seeing the word desire shocked me: my mother, who never expressed her wishes and did not seem to demand anything, not even a biscuit to go with her tea. I phoned my father a few times from Israel. He was kind and affable but felt far away. I texted and emailed friends, kept in touch with Hugh whose replies to my emails were always warmer than mine to him. I tried to mirror his language, matching his tender words with my own, but something restrained me. Should I open myself to him like a book at its centre? Let him in? I thought of the enjoyable evenings we had spent together, walking by the river, watching the swans puff themselves up on the water; the meals we’d had in our favourite trattoria and the nights we had spent together where I had offered myself physically to him; but we had both known that emotionally I was closed. On the boat, the men took us to the centre of the lake where no shoreline was visible, as if the land had disappeared and stilled the vessel. It bobbed slightly on the water. My aunts recited Kaddish together, which they told me was the mourner’s prayer. The words sounded alien to me. Then together we three women took the bag from the red box, our hands overlapping each other and scattered Mum’s ashes upon the water. They remained defiantly on the surface for an instant and then dissolved and vanished. ‘She is peaceful now,’ said Hannah and Esther nodded her agreement. I fingered the locket around my neck, which my mother had given me, her tiny photo trapped inside. ‘But I still don’t know why she wanted to be scattered on this lake,’ I said. Hannah demonstrated her disapproval by moving to the other side of the boat, turning her back to us and staring out at the water, as if she didn’t want to be implicated, didn’t want to hear. ‘Your muzzer,’ began Esther slowly, carefully, ‘was very clever at school and our abba –father – was very proud of her. He has high hopes. After ze army, she does not know what job she likes to do so she, Shoshana, goes to ze kibbutz there.’ And as if on cue, the community came into view: I could see its sugar cube houses in the distance, clinging to the hills. Hannah turned to stare at Esther, called out something in Hebrew which I didn’t understand. She had fury in her eyes. ‘Your muzzer got -’ She mimed a round stomach with her hands. I felt my heart thudding in my chest and my legs quivering. I felt the bottom of the boat collapsing beneath my feet and thought that I was falling through water. Maybe I too had become ashes and would rejoin my mother, the mother I clearly had never known. ‘Mimi is my sister?’ I thought of the dark-haired girl who stumbled in and out of the dining-room, carrying a jug of water, a plate of watermelon. I had not seen her eyes, her face always downturned. The lake and land spun, bled into each other. We left the boat and thanked the crew. I wondered what they thought of me: cheerful at the start; weeping in the middle; stunned at the end. In a restaurant in nearby Tiberias, we ordered salad and fish. Fifteen porcelain dishes were brought to the table, forming a ceramic mosaic on the cloth: humous, tahini, pickles, tomato and cucumber salad, yoghurt, roast cauliflower crowned with sunflower seeds, eggplant dip, chopped beetroot stained by its own juices. We ate in silence, the sisters angry with each other, me in a state of shock. ‘Does my father know about Mimi?’ I asked, after a while. My aunts shook their heads, avoiding each other’s eyes. The friction between them was palpable. On the last day of my visit, my aunts went shopping for gifts for me, their relationship slowly healing, but I asked to stay at the house. I had packing and washing to do, I told them. Once they had gone and the house was quiet, I left the back door, went through their pretty garden and down to the small house where Mimi lived. I knocked and waited, watching the sprinklers arch their gentle flow upon the dry grass. It took Mimi so long to answer, I thought she would not do so; but at last the door opened tentatively and she peered round the frame. She looked wary but I let myself in. Her home was plainly but pleasantly furnished: wooden chairs in the main room with embroidered cushions, white shutters striping their shadows on the wall. Her dark hair framed a sweet face but her eyes stared down. She went to the kitchen, limping slightly and returned with a glass of juice for me. I took it, ‘Todah rabah,’ and drank. I tasted guavas and passion fruit, as if she were giving me the sweetness I needed. On the wall there were framed pictures, delicate, pencil lines, of flowers and fruit. I pointed to them in appreciation. To my surprise, she went to her room and returned with a portfolio of her drawings. The lines were so faint that at times they were barely discernible but her talent was impressive: the serrated edges of shells; the outside and inside of tropical fruits; mountains delicately drawn. I nodded and smiled. She seemed pleased. ‘These are really good,’ I said and although she did not comprehend the words, I was sure she understood the tone. I took the locket of my mother – our mother – from my neck and placed it around hers. Our faces were so near I could smell her honeyed breath, feel her soft hair, her olive skin. The locket hung there, incongruous with her plain dress, the gold catching the light as she moved. She lifted her face and the dark eyes that looked at me were the eyes of our mother. We half-smiled while I drowned in them. Then she gave me one of her pictures. It was of the view from her window into the garden: mangoes and lemons, pencil drawn. I conveyed my thanks to her with an embrace. By the time my aunts returned, I had packed. They had brought a slab of halva to take for my father and I accepted it graciously, not telling them that to him, this crumbly honey dessert would seem unfamiliar. They had bought me books of poetry, maybe to ease my shock. And Esther said no, she liked to be alone. She enjoyed drawing. She was talented. They used the money Sho – Rose – sent to buy her art materials. ‘May I carry on sending her that monthly allowance?’ I asked and they agreed. ‘And may I visit you all again?’ They smiled through glassy tears. And we hugged again, as if they were passing on the affection that my mother had been unable to give me. On the aeroplane, waiting for take-off, I looked at my gently tanned skin as if I was edging closer to Mimi. I texted Hugh ‘I love you. I want to be with you,’ turned off my phone and closed my eyes, only opening them again when I glimpsed through the small window the thin green skin covering England. Tamar Hodes was born in Israel in 1961 and has lived in the UK since 1967. 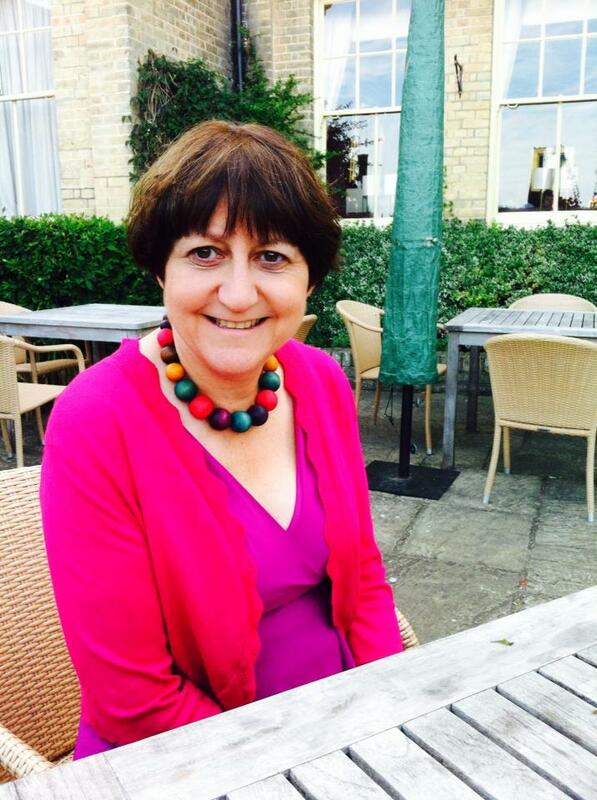 For the past thirty-two years she has taught English in schools, universities and prisons. Her novel Raffy’s Shapes was published by Accent Press in 2006. She has had stories on Radio 4 and others in anthologies including Salt’s The Best British Short Stories 2015, The Pigeonhole, Your One Phone Call, the Ofi Press and Fictive Dream. Her novel The Mauves was shortlisted for the Wells Literature Festival children’s writing prize. Tamar is married with two grown-up children.